Chhath Puja or Bihari chhat is an Indian ancient historic festival celebrated in Indian subcontinent especially in the states of Bihar, Uttar Pradesh, Jharkhand, West Bengal, Orissa, Assam & in many other states of India and abroad too. Chhath Puja is also celebrated in some regions of Nepal, Fiji, South Africa, United States, United Kingdom, New Zealand, Australia, Malaysia, Indonesia, Japan & many other nations. The Chhath Puja is celebrated to worship Lord Sun as well as his sister to thank them for giving sunlight to our mother Earth. Chhath Puja does not involve any idol worship. It is celebrated after 6 days of Diwali. There are several rituals involved in the celebration of Chhath Puja which lasts for four days. These rituals include fasting without drinking water, bathing in the holy Ganges or in other small water bodies like a lake or a pond, preparing Prasad, ‘Sandhya arghya’, ‘ surya arghya’ & many more. Those who keep fast and perform worship are locally called “Parvraitis”. These are usually married women. ‘Parv’ is derived from a Sanskrit word which means a special occasion or a festival and ‘vratis’ means those who keep fast. Nowadays, Chhath Puja is celebrated by several people & there is no gender specification for celebrating the same. Prostration march is also performed on the banks of the river. This is environmentally proven that Chhath Puja is mostly an eco-friendly festival celebrated in our country. The Goddess or deity praised during the four days of Chhath Puja is called as ‘Chhathi Maiya’. Chhathi Maiya is the beloved daughter of Lord Brahma who is also famous as Devsena & Shasthi Devi in Hindu Vedas. Chhathi Maiya is a form of Goddess Parvathi, beloved sister of Sun and the wife of Lord Shiva. During Chhath Puja, Goddess Parvathi returned from Kailash in the form of Chhathi Maiya when Dinanath comes to receive her. In certain regions, Chhathi Maiya is worshipped with the name of Rauna Mai. Chhath Puja is like thanks giving festival to Lord Sun for providing sunlight to Earth. According to Indian mythology, it is believed that those who perform this Pooja with faith, all their wishes get fulfilled. The festival also has many scientific reasons behind its celebration. Chhath puja involves four-day long celebration. There are many rituals and customs that need to be followed strictly. Devotees on the first day of Chhath Festival take bath in the holy Ganges and it signifies the beginning of this festival. ‘Vrati’ is the name given to all ladies who keep fast and performs rituals and worship during the Chhath Puja. Holy water of the River Ganga is brought at home & Prasad is prepared using holy Ganga water. The Prasad includes thakua (a local sweet food item), tikri (a sweet tradition snack), laddoos, kheer, puri, channa dal, fruits like banana, apple, guava, coconut, sweets & many more delicious things. The vratis on the second day of Chhath Puja keeps fast for a full day & it is the starting of three days long fast. They perform puja and rituals for Chhati Maiya during sunset time. Kharna is the name given to the fast. The whole day is spent in preparing foods, shopping, performing Pooja & other rituals. A special Kheer made up of ’gur’ is also prepared. Rauna Mata is worshipped and the devotees eat Prasad in the evening after Puja. Prasad and other ‘Puja Samagri’. 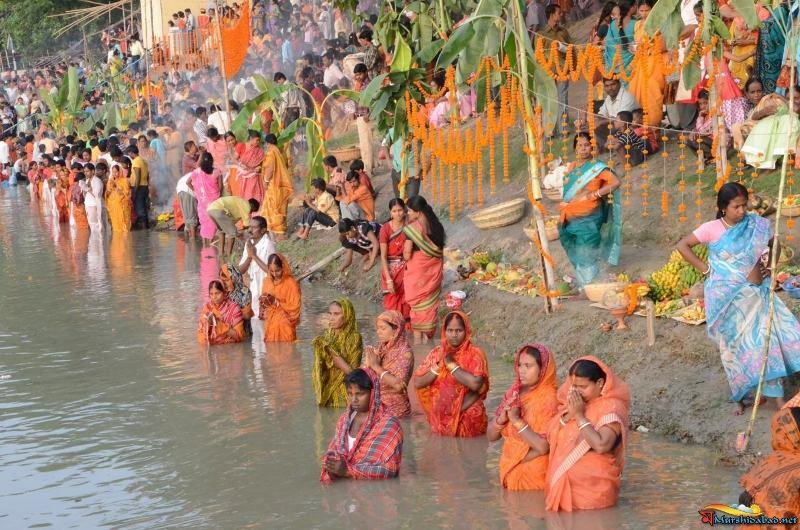 ‘Sandhya Arghya’ takes place during the sunset when women worship and make offerings to Chhathi Maiya, standing in the water while facing the sun. Devotees worship Lord Surya during the sunrise on the last day of this festival. This is also the end 36 hours long fast of Vratis. They break their fasts after having water & ginger & Prasad. There are many scientific reasons which show that all the rituals of Chhath Puja have its own benefits. The Sun is the natural source of Vitamin D. It provides calcium and Vitamin D to the ‘vratis’ who perform rituals while standing in the water So, Indian people celebrate the Chhath Pooja to worship Lord Sun & thanks him for giving sunlight. The rituals that are involved during this festival helps to make the immune system strong and have antiseptic effects. Various rituals of this festival help a person to achieve mental peace and calmness and physical fitness.